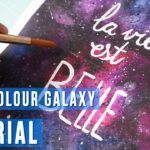 5 EASY WAYS TO DRAW A GALAXY | Paint Galaxies Using Watercolor, Acrylics, Ink Blending and Markers! Painting People Looking Out at a Galaxy in a Night Sky with Acrylics in 10 Minutes! Painting a Galaxy and Stars with Acrylics in 10 Minutes! Spray paint painting tutorial video of a space galaxy with planets....AMAZING!!!! !